A modern landscape for a historic cemetery by Halvorson Design Partnership and HGA, the remaking of a major Parisian public square by TVK with Martha Schwartz Partners and Areal Landscape Architecture, and the long and winding road back to health for the L.A. River are all in the April issue of LAM. The Climate section looks at Buenos Aires’s flood problem; Now embraces landscape “failures” and reconsiders contaminated military sites; and in Palette, Bernard Trainor, ASLA, melds his native Australia with California natives in his planting designs. All this plus our regular features in Species, Books, and Goods. You can read the full table of contents for April or pick up a free digital issue of the April LAM here and share it with your clients. 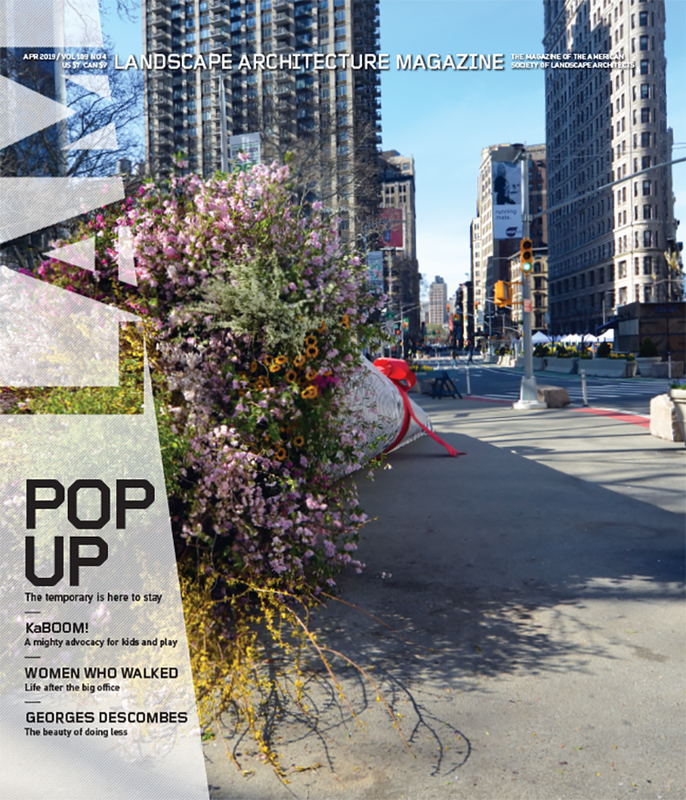 As always, you can buy this issue of Landscape Architecture Magazine at more than 200 bookstores, including many university stores and independents, as well as at Barnes & Noble. You can also purchase single digital issues for only $5.25 at Zinio. Annual subscriptions for LAM are a thrifty $59 for print and $44.25 for digital. Our subscription page has more information on subscription options. Keep an eye on the LAM blog, Facebook page, and Twitter feed (@landarchmag), as we’ll be ungating some April pieces as the month rolls out—excellent accompaniments to a very welcome spring. Credits: Lakewood Cemetery, © Paul Crosby; Place de la Republique, © Pierre-Yves Brunaud/Picturetank; Pistia, Peter Essick/Aurora Photos/Corbis; Landscape Fails, Niall Kirkwood, FASLA; Palette: Bernard Trainor, Jason Liske.